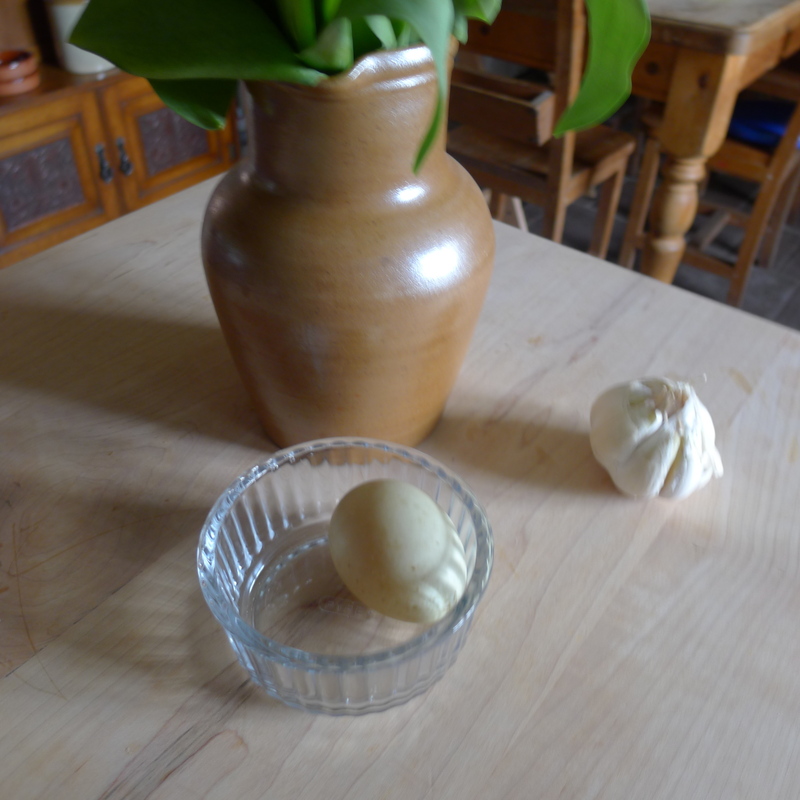 We have had our first duck egg! I am disproportionately excited. It was the classic duck egg blue colour, although covered in mud, and perhaps a little murkier than most interior designers would have it. I have happily been reading up on egg recipes, and the properties of duck eggs. We have now had our first home produced duck egg meal. As is typical for ducks it wasn’t laid in a nice little nest, but just wherever she happened to be standing at the time. In this instance that was in the mud by the paddling pool. It’s a good job ducks don’t lay dark brown eggs else I’d have the devil of a job spotting them. I decided to wait a couple of days to get more than one, (four in fact) and then it was duck eggs for dinner. (We only have one laying female at present, it being early in the season. She’s called Campbell, after my son’s class mate. I’m still not sure about this naming convention). Now according to my reading, duck eggs aren’t simply big hen’s eggs from a cookery point of view. The yolks are richer, but more importantly from a culinary perspective the whites are higher in protein. This means that they are very good indeed for baking – hence the widespread view that an excellent thing to make with duck eggs is a sponge-cake. It also means that they can turn very rubbery very quickly. Hard boiled eggs and those dishes where you turn the egg onto a dish and cook it further in (baked eggs, eggs broken onto tarts or pizzas) risk going pretty wrong. So I chose my recipe carefully. Chinese cuisine had long used duck eggs to great effect, the traditional classic “1000 year old eggs” uses them for example. I didn’t feel in that mood though, so I went in a different direction. After extensive consideration of Tunisian briks, simple soft boiled, custards, cakes and omelettes of varying kinds, I decided to go meurette(-ish). Now I have already shown my true colours as a poached egg loving type on this blog, with my eggs Marmatine, but I can’t help feeling that yet again the way of the poached egg is the best route. The egg shouldn’t be too well cooked when poached to runny yolk perfection*, so no rubber, and it show-cased my little ovoid treasures. A true oeuf meurette involves mushrooms, shallots, and a little round of toast, and I can do no better than direct you to the youtube footage of the great Michel Roux Junior preparing this classic dish. Mine was a little different simply as a result of the ingredients I had in, and what I fancied eating. Click here for the recipe. * The advice on runny eggs for vulnerable groups, that is to say they shouldn’t eat raw or runny eggs, applies more strongly for duck eggs according to EU guidelines. I am not pregnant, particularly old, particularly young, nor vulnerable in another way, and I know exactly where my eggs come from, so I eat my eggs with runny yolks with impunity, but make your own choice according to your situation.